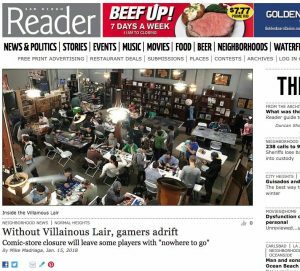 Over the weekend (January 14–15) hundreds of gamers like Bantelman congregated at the Villainous Lair Comics & Gaming store in Normal Heights, paying up to $30 to score the Ixalan cards from the newest Magic the Gathering game set. On Friday (January 12th) at midnight, “over 70 gamers” lined up for first crack at the new set. 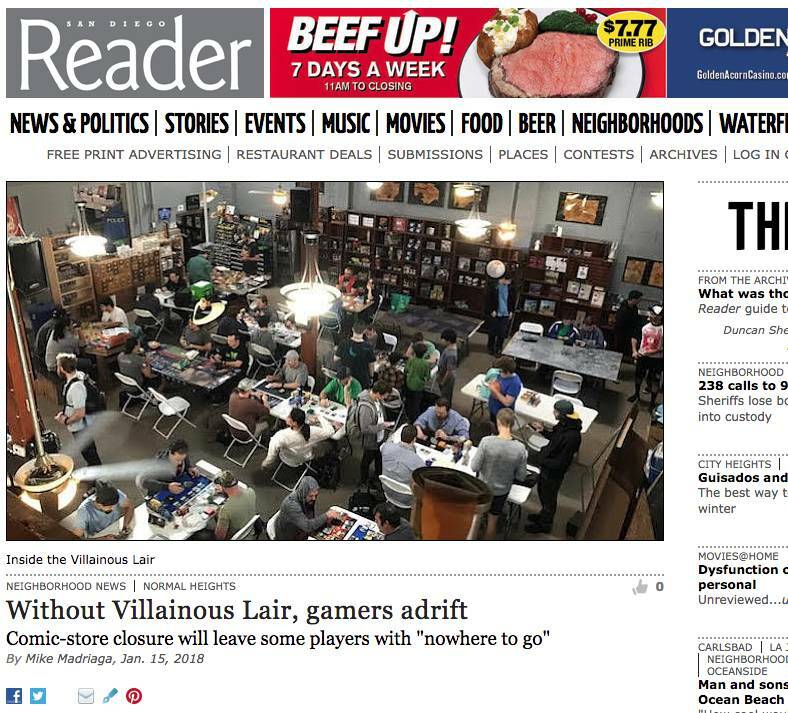 But the exhilaration of obtaining the latest creatures, artifacts, sorceries, enchantments, instants, and mana (land) wore off as the gamers spoke about the fate of their local gaming hub. Mitchell blames their slow sales on collectors being able to buy the card games at Walmart, Target, and “then Barnes & Noble’s saying, ‘We are doing game night so you guys can do this over here [too]’; and Amazon is opening up stores that cater to this type of stuff, too…. Many of the gamers played at the 4700-square-foot facility for hours and some went on weekend binges, continuing the duels at their homes. Caffeine and snack breaks at the nearby Starbucks or Lestat’s was common and a comic-book read in front of the venue “counterspelled” the monotony. The other gamers I spoke to said that they have “nowhere to go” and feel displaced.